The rigging of period ship models is arguably the most complex and daunting task for the modeler. An eighteenth-century man-of-war boasted mile upon mile of rigging, over 1,000 blocks, and acres of canvas. To reduce the rigging in scale and yet retain an accurate representation is a formidable undertaking. After studying numerous eighteenth-century museum models, the author has drawn some four hundred diagrams which clearly show how each separate item of rigging is fitted to the masts, yards, and sails. Each drawing deals with only one particular aspect and is accompanied by a logical and straight forward narrative. For example, the fore deadeyes and channels are shown before the shrouds are added, and these are depicted before the ratlines are added. 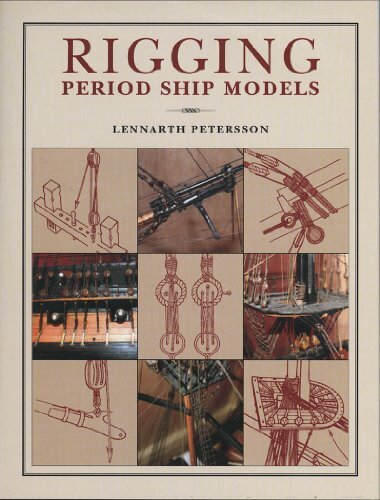 Whether a model maker needs to rig a whole ship or just requires information on one aspect, it is all here in this beautifully produced volume that no modeler of period ships should be without. Content remains the same irrespective of the jacket covers in subsequent printings. If you have any questions about this product by Petersson, Lennarth, contact us by completing and submitting the form below. If you are looking for a specif part number, please include it with your message.